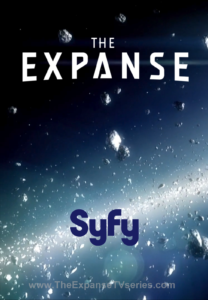 Last Monday, the SyFy channel premiered a new TV show called The Expanse, based on the book series of the same name. I haven’t read the books but I was intrigued by the pilot episo de and I will give it a go, especially since December and January are the wasteland months of cable TV. I’ve always been a fan of serious sci-fi, particularly the more contemplative works by authors such as Isaac Asimov and Arthur C. Clarke. I enjoy the hardware-heavy action bonanzas of Robert Heinlein or the fantasy/religious/mystical/what-the-heck-did-I-just-read epic tomes of Dan Simmons, but there’s always been something about the cold metal ship drifting between stars that has always held a romantic appeal for me. Movies about tiny humans navigating the unfathomable distances of space, such as 2001: A Space Odyssey, Sunshine, and the parts of Interstellar that didn’t make me gag on my popcorn spark the fires of my imagination even though many consider them to be boring, pretentious, and over-serious. Perhaps the reason for this appeal is because of the relatively realistic depictions of space travel that these books and movies explore. No glitz and glamor, no whiz-bang weaponry, no baritone space Nazi warlords. Just fragile little people terrified to death of the vast emptiness of space. It’s easy to imagine how such a journey would drive anyone to the brink of madness, if not over it. If you were on a spaceship that was traveling at 99% light speed, the backdrop of stars wouldn’t change for years. YEARS. You would be an infinitesimal particle in an endless void heading towards a giant black curtain with pinpricks of light showing through. Nothing would tell you that you were moving unless you turned the ship at a different angle (just like the moon follows you when you drive at night, the stars would follow you as you sped through space). It’s in a place like this that a person could plumb the deepest depths of their soul and come face-to-face with their own insignificance and mortality. Here on Earth, we have no idea what this is like. We have friends and family available at the touch of a button. We post a selfie and get fifty “likes” by the end of the day. We are constantly reaffirmed as having value and effect on people around us. But out there, in the silent darkness, we are literally nothing. A mote of dust floating between continents. As has happ ened numerous times on the page and on the screen, people have confronted their place in the universe and been utterly broken. I think that would be a perfect moment to truly examine what one believes. Ultimately, it comes down to faith. I’m sure you’ve seen the video going around on social media that keeps zooming in on a photograph of the stars. Each tiny section that is enlarged shows more and more stars, and it is a staggering sight. How could so many stars be crammed into such a seemingly small space? And then you realize that there are TRILLIONS of miles in between even the closest stars. I feel like a YA fangirl because I. Literally. Can’t. Even. When I watch these programs and read these books and imagine that I am on these ships, believing that there is a God who rules over the universe would be the only thing that would keep me from losing my mind. Out there in the cold black void, there is not madness; there is majesty. I have the first episode on my PVR. Looking forward to this one as the author (Daniel Abraham – he wrote The Expanse under his pen name, James Corey) was at a writing conference I attended this past summer and he talked about it a bit. The immensity of space is truly humbling and awe-inspiring. My husband would love to get on a shuttle and go to Mars or something, not me, thank you! It freaks me out just a little – kinda like how a submarine freaks me out. I read the first book (Leviathan Wakes) and I’m eager to get the rest. If this show follows the book even vaguely, it’ll be fan-freaking-tastic. I wish they would hint at the monsters that appear later in the story (which was the primary draw for me), but I imagine that’s too far into the TV series. So right now, it looks like one more politics-in-space thriller. But it’s so much MORE. Your post reminded me of that movie Europa Report, which I enjoyed but the naturalistic philosophical underpinnings of the film were intriguing. The last woman standing was willing to sacrifice her life because she understood that compared to what we didn’t know in the universe, what did her life amount to? That insignificance factor, without the presence of a Creator who cares about us, makes all the difference.